Rolo Adventures is launching a Kickstarter crowdfunding campaign for a new travel bag called Rolo. 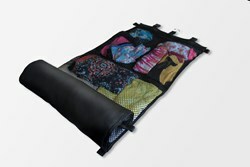 Rolo is a new roll up clothing organizer that makes traveling more enjoyable and less stressful. Rolo is a clothing organizer that rolls up, and can be hung from the included hanging hook. Local San Francisco travel startup Rolo Adventures LLC has announced a Kickstarter Crowdfunding Campaign for their brand new travel invention: Rolo. This groundbreaking invention simplifies the entire traveling experience, eliminating the need to unpack to access your clothing. The secret lies in the compartmentalized roll up design: Rolo's unique functionality compacts your clothing to the size of a bedroll, and allows for simple storage either strapped to the outside of your bag, or tucked inside. When it is unrolled everything stays compartmentalized and can be hung for easy access. The founders of Rolo Adventures LLC are avid travelers themselves, and claim that they came up with the idea while exploring Europe. “It just makes sense,” said Benjamin Taller. “We were surprised that no one had thought of this before. You know how it is...you get to the room and want to find your PJ's and you gotta pull everything out - Rolo solves that." The Rolo is constructed out of strong lightweight materials. It measures 17" x 3" x 3" when empty, and only weighs a little over a pound. Rolo Adventures LLC has outlined plans to manufacture in America, and is closely working with a manufacturer based near San Francisco, CA. Rolo is scheduled to start shipping in April 2014. Rolo can be pre-ordered from Kickstarter by this link: http://kck.st/1aCZyfZ.